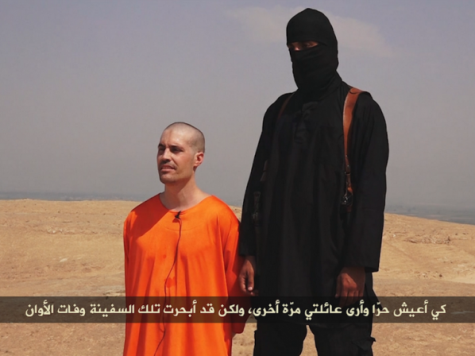 The Islamic State released a video of its jihadists beheading American journalist James Wright Foley in Syria. The video is almost five minutes long and includes threats against President Barack Obama and the United States. Foley then appears on his knees in an orange jumpsuit. He relays a message that the US government is his true killer. He addresses his family as well. The message is choppy, which gives the appearance that he is reading off cards placed in front of the camera. His executioner speaks with what appears to be a British accent, saying many Muslims worldwide accepted IS and a war against IS is, in essence, a war against Muslims. The UK has been one of the Islamic State’s most active targets of recruitment. After he beheads Foley, he presents to the camera another journalist, Steven Joel Soltoff, who worked for Time and The National Interest. Soltoff was reported missing in the middle of last year. The executioner said America’s next move will determine IS’s next move in what appears to be a threat against the second journalist. Foley was an independent journalist in the Middle East. In 2011, he was one of four journalists kidnapped by Qaddafi’s forces in Libya, of which he said in an interview with the Boston Globe, “You don’t want to be defined as that guy who got captured in 2011… believe that front-line journalism is important.” He spoke at Northwestern University about his experience in Libya. His family had set up a website to help find Foley since his disappearance in Syria on Thanksgiving 2012.